The microblogging service Twitter has become a very big deal, enabling everybody to depose dictators, mock X Factor contestants and lose their jobs for posting offensive things when they're drunk. However, while the service itself is really simple the choice of desktop Twitter software isn't. From stripped-down clients to do-everything social media dashboards, there are stacks of Twitter programs to choose from. So which ones are best? Here are 22 options for 2012. The official Twitter website is a marmite affair: some people hate it, while others really hate it. The free OS X client is a much nicer effort, though, with tweets and direct messages and multiple accounts in a small tabbed window that looks rather like an instant messaging app. It's the closest thing to a mobile Twitter app we've seen on the desktop. The Iconfactory's Twitter app normally costs $9, but Twitterific is currently half price on the Mac App Store and there's a stripped-down free version to play with too. Like the official Twitter app it resembles a mobile app — you can sync between it and your iPhone and iPad versions — but there are additional features including easy translation of foreign-language tweets, multiple account support, keyboard shortcuts, multiple windows (in the paid version) and a choice of light or dark themes. Echofon is available for almost everything: there are iPhone and iPad apps, a Firefox extension and desktop versions for Mac and Windows. The free version is ad-supported, and going ad-free is a reasonable $9.99. The desktop apps sync effortlessly with their mobile siblings, support multiple accounts and include a nifty Detail Window that enables you to easily see entire conversations and user details. The Mac version also has drag and drop attachments and what Echofon calls a "super clean interface". 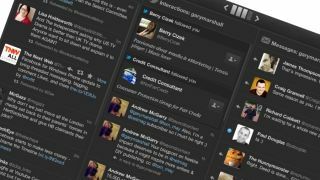 Janetter claims to be the best Twitter client on the net, and while that claim's open to debate it's certainly one of the more flexible apps out there. There's a multi-column view, support for multiple accounts, 27 different themes, customisable fonts and display formats, wallpaper, notifications, autocomplete, keyboard shortcuts and language translation. If you're using the Windows version you can even create your own themes in HTML. Tweetings is another multi-platform client with versions for iPhone, iPad, Google's Chrome browser, Windows and OS X. The Mac version's nicer than the Windows one, but both offer a decent selection of features including device synchronisation, filters, scheduled tweets and Twitlonger support for when 140 characters aren't enough. The Mac version is £1.99 and the Windows and Chrome versions are free. Echelon would be better described as a Twitter viewer than a Twitter client: it enables you to see what people are talking about, one tweet at a time. It's an interesting little diversion, but it's strictly read-only: if you want to post, you'll need a different program. This chat software-inspired Twitter client "aims to make your timeline as useful as possible by blocking annoyances and revealing gems". There's easy keyword blocking, the ability to mute users without unfollowing them, threaded conversations, inline saved search results and an option to hide specific tweets if you find them annoying or offensive. The app is $9.99, but you can download a free trial from the Hibari website. This Adobe AIR app is one for power users with an interface that's as big or as small as you want it to be: you can go full-screen and multi-column or tuck it away in a corner of the desktop. Destroy Twitter boasts an excellent range of filters, lots of customisation options, username autocompletion, nice notifications and a small memory footprint. Here's one for the social media gurus: a "social media dashboard" designed to manage multiple social network profiles, keep track of mentions and auto-update your profiles from RSS feeds. Hootsuite Pro is $5.99 per month and there's a free version that supports up to five social network profiles. It's overkill for individual users but it's a powerful tool for online businesses. Sobees Desktop is another social media dashboard, with support for not just Twitter but also Facebook, MySpace and LinkedIn. It's clearly aimed at social butterflies — "check your MySpace friends' activities and update your own mood" is one of the selling points — but it's quite clever and as it's currently in beta, it's free. Buffer is an odd and very clever little app: it's designed for post scheduling, and it integrates with a wide range of services including IFTTT, Mr Reader and various social sharing services. Simply fill up your Buffer with a bunch of stuff, tell it when to post each item, and then go and do something else. The free plan gives you 10 posts at a time, rising to 50 posts for $10 per month and unlimited ones for $99 per month. Now owned by Twitter, Tweetdeck is the Twitter app for power users: its multi-column view and powerful filters enable you to keep on top of what matters to you, scheduled tweets enable you to pre-plan posts and you can use as many Twitter accounts as you can create. Tweetdeck is free. Seesmic comes in two flavours: a browser-based version with support for multiple Twitter, Facebook and LinkedIn accounts, and a desktop app that integrates with over 90 third party services including Klout and Stocktwits. There's even an App Store-style Marketplace where you can find add-ons for the likes of Flickr and Gowalla, although we wouldn't bother with the latter one as Gowalla shut down months ago. Both the desktop and web-based versions of Seesmic are free. Kiwi's pretty, tabbed interface is a joy to look at, but there's substance to the style: the rules-based filters are particularly good, and you also get goodies including autocomplete, user groups, themes and optional merged timelines that show tweets, mentions and DMs all together. Kiwi is free. Weet is another good-looking OS X Twitter app with support for multiple accounts, ReadItLater and Instapaper integration and user and keyword filtering, but at $4.99 in the Mac App Store it's up against some awfully good and free Twitter apps. We suspect that the developer may have lost interest: version 1.0 was released in February 2011 and hasn't been updated since. Socialite is an unusual-looking app that reminds us of NetNewsWire or a cheerful email client: it integrates Google Reader and other RSS feeds as well as Flickr images, but it connects to Facebook and Twitter too. If you're looking for a single app that spans not just social networking but photo sharing and RSS it's certainly worth a look, but we'd rather use stand-alone apps for each. Socialite is $9.95 but you can put it through its paces for free. Written for Adobe's AIR, Twhirl connects to multiple Twitter accounts as well as other social networks (Facebook, MySpace and LinkedIn). It covers the basics and it's hard to argue with a price tag of zero, but it's up against some very accomplished competition. The horribly named Spaz runs in AIR, supports multiple themes and also supports the Markdown language, but its main claim to fame is its support for the open source Identi.ca and Laconica microblogging platforms. Spaz is free and free: there's no price tag and it's open source. Like Twitter? Like Windows' Metro interface? Then allow us to introduce MetroTwit, which is arguably the best-looking Twitter client for Windows. There's the ability to filter not just people and keywords but specific applications too, and a handy OMG! feature that enables you to undo the Tweet you just posted. MetroTwit is free, but if the adds annoy you the ad-free, multiple-account upgrade is £9.82. "Itsy won't hog up your screen or do other crazy things," the developer says, correctly. It's a simple, skinnable, single-account Twitter client for the Mac that looks nice and includes "tinyness" in its feature list. Itsy is free. Rather disappointingly, YoruFukurou isn't a horrible insult: it means Night Owl, and it's a tabbed, multi-account Twitter client for OS X. It's a little cluttered for our tastes but there are plenty of customisation options, good keyboard shortcuts and a decent selection of rule-based filters too. YoruFukurou is free. This good-looking AIR app is worth considering if you see Twitter as a broadcast medium full of interesting things to read and look at: it integrates not just Twitter but other sites including YouTube and Flickr, and there's a slideshow view for the latter so you can view photos without distractions. Skimmer is a free download.